Throughout human history, our mythology has often defined our future; even predicted it. The Mithos could be the car design that does this for the future evolution of automotive. When Jules Verne wrote 20,000 Leagues Under the Sea, he predicted the emergence of the long-range, submarine voyages that, a few decades later, became reality. In Mayan prophecy, they predicted that gods would come from the east and bring an end to their empire. When the Conquistadors landed, that myth became reality. Today, Portuguese industrial designer Tiago Miguel Inacio has brought forth his prediction for the future of automotive evolution: the Mithos. The car looks much like a Bugatti Veyron if you were to remove the side scoops at the rear wheels. Those are not required since the Mithos Electromagnetic Vehicle uses a powerful motor rather than an engine. Powerful as in 1.5 megawatts. That translates to 2,011 horsepower for those counting, giving the car a likely 0-60 time that the G suits pilots of today wear would be shredded. The bodywork of the Mithos is made from a futuristic material called H-Fiber which remembers its shape, so an accident or damage to the vehicle would self-repair. Underneath, the suspension uses a Terrain Scanning System which morphs and adapts to any road environment the vehicle might be driving upon. Finally, something called Molecular Teleportation Technology can be utilized if your 2,011 horses aren't fast enough to get you where you need to be. It should be obvious that currently the only thing on the Mithos that is technologically possible is the motor, though powering that motor is a whole different story. 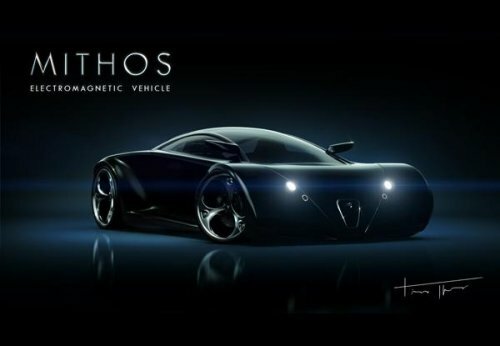 Still, as a look at what might be possible given a few more years of advancement, the Mithos Electromagnetic Vehicle could very well be a glimpse into what might be coming as our cars continue to evolve. That, friends, is what makes a story into a myth. Interesting piece Technically Pecos Bill and Paul Bunyan are myths. The coming of the Conquistadors and the Messiah were prophecy. There are already surface scanning vehicles that adapt to conditions. Do you think by the time we can create a car like this we will still be roadbound? Isn't the conveyance that moves through the air the next solution to gridlock? And once you can teleport anything why would you need a car? Certainly Mithos has hit on something to stir discussion and imagination.